I love the movie White Christmas. But you know what I love more than the movie? The stage production! BYU put on an absolutely stellar performance of this show and you may remember I made the trek to P-town to enjoy it. What I didn't enjoy was getting a flat tire. My southern gentleman friend (don't anyone go getting excited, I said friend for a reason) and I pulled into the law building parking lot only to see a semi-flat tire. 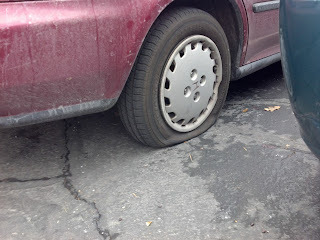 By the time we got our Creamery ice cream and headed to the Fine Arts Center, the tire was totally flat. Boo. Luckily, my friend and car efficienado, Andrew, lives in Provo and he came and fixed us up with the donut while we enjoyed the show. Monday morning I headed to Big-O for a free flat fix. I like free much more than I like flat tires. I suppose a flat tire is not of much consequence to most people, but this is only the second of my life - quite noteworthy for me. How many flat tires have you had?